It’s that our favorite time of year again… Dragon Burn season! What does that mean? Get ready for pre-parties, fundraisers, Burn-swaps, and Burnducation events leading up to the Dragon Burn 2019, May 1st-5th. 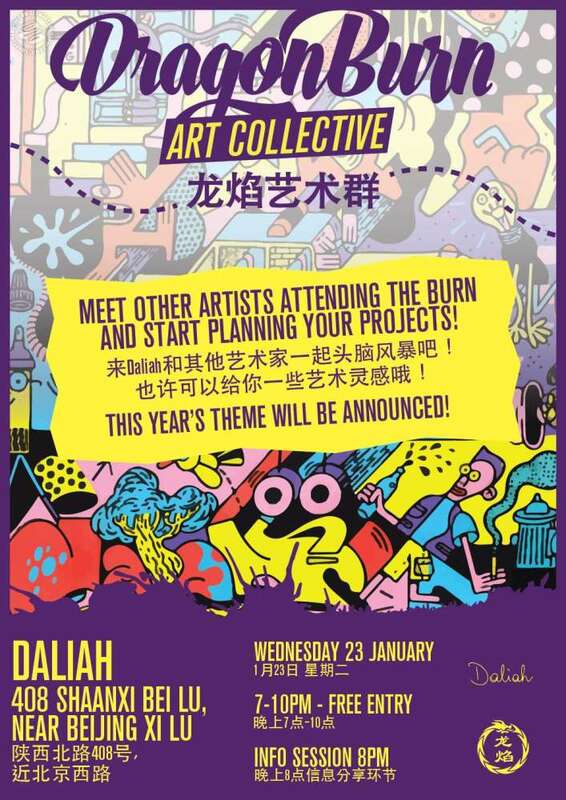 As usual we’re having our first Art Collective meeting before Chinese New Year. So whether you’re home with your family or sipping Mai Tais on a beach in Thailand, you can brainstorm your participation at the Burn and get in your art grant applications! The event kicks off at 7, with music by Lev Zepp and videos from Burning Man to inspire your burn creativity! We also know you slackers come late, so we’re giving you some time to chill before getting to the important business of the evening. From 8pm to 9pm we’ll have our information session where you’ll find out everything you need to know about Burning Man, Dragon Burn, and how to create or join an art installation. Once the meeting finishes, Clem de la Crème will be taking over the music while you mingle and enjoy some awesome drink deals from Daliah.